“The Jewel of Kedah” as it is popularly called by the locals. Lush green rainforests, waterfalls, bizarre rock formations, the soft cotton like low lying clouds, surrounded by a warm pristine clear sea with white sandy beaches, smooth roads and the dense forests by the roadside is Langkawi for you! It is pure bliss for nature lovers. 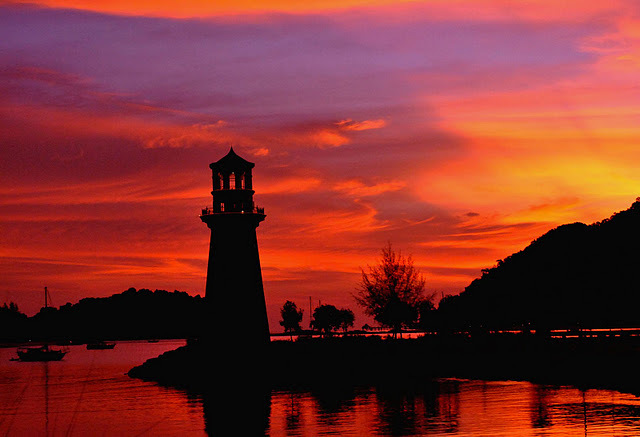 Langkawi is a small island situated near the border of Malaysia and Thailand. It is an archipelago which forms close to 100 islands. All great cities have a mystifying story behind the origin. The locals here believe that the young beautiful lovelorn woman named Mahsuri laid a curse on this island for seven generations. They owe all the success of Langkawi to the passing of the curse. Whether you have planned a luxury trip or a low budget backpacker journey, both offer an unforgettable experience on this mystifying Malaysian island. Arriving at the Langkawi airport, we were greeted by a smiling beautiful Malaysian lady saying “Selamat Datang” (“Welcome” in Malay)! With good bargaining finally we got a taxi at almost half of the price told! So you got to keep your bargaining skills up during Langkawi stay to get good deals. You can book a taxi to roam around. However, rental cars and bikes are easily available (do not forget to bring your driver’s license). As you drive, look out for the roadside stalls around the island selling banana fritters, curry puffs and chicken satay. It gives a bird’s eye view of the island. Sky cab is a three station cable car. There are two observation decks with 360 degree panoramic view of the island. Oriental Village is where there are many Malaysian and oriental architecture. It is like a modified cultural village. It is a bustling city. This is where the prominent landmark Eagle Square is located. This place has splendid view of the sea with the gigantic eagle at the back ground. We were awestruck with the fascinating and magnificent look of the eagle. The mangrove trees are preserved very well. You get a chance to feed the eagles. You come across many caves and bizarre rock formations as well. Some other activities include burned rice fields, underwater world Langkawi, sky diving, Mahsuri Tomb, Langkawi cruise, Langkawi crocodile farm and Bird Paradise Wildlife Park. Not to forget the usual water sports like jet skiing, para gliding etc. along the beach. We did manage to catch one beautiful sunset at Tanjung Rhu beach. Langkawi has been given a World Geopark status by UNESCO. It has 65% of its forest area intact. Apart from all the above activities the duty free shopping malls are a big attraction. One can buy apparels, alcohol, chocolates ,cosmetics, souvenirs, cooking ware and needless to say electronics. For foodies, Langkawi has many choices for local cuisines to try. Nasi Lemak being the local popular one. You may find the variety of snacks and meals at many cafes, night markets or food stands. Do not miss the mouth-watering ice cream and the particular style in which it is made and served. 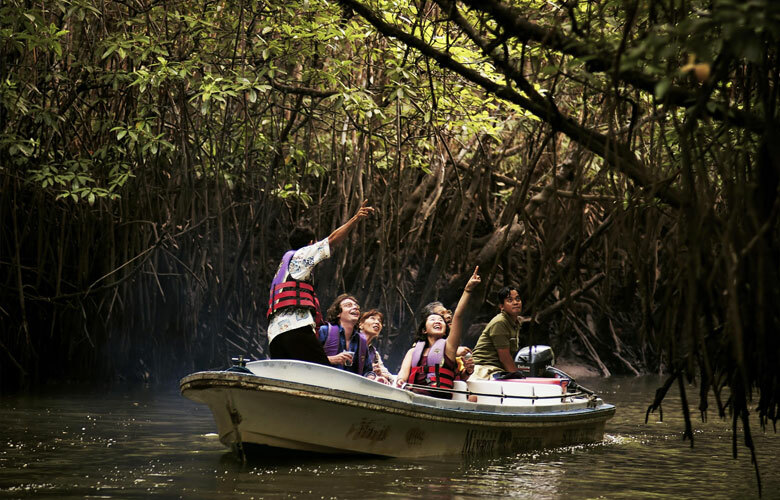 If you are a nature lover, want to unwind and at the same time explore and enjoy some activities then Langkawi is a place to be. It is a place to visit and return again, just as the waves do to its island shores! Sanchita Satalkar has completed her MBA in HR. She has worked in areas of HR and had a brief teaching experience at SIBM. Sanchita is a fitness enthusiast, avid reader and an aspiring writer. She also worked with Herald newspaper as a campus reporter while pursuing graduation. Her writing was recently published in the book “Best of Kalamwali 2016” and “Rutugandha”. She is currently a full time mother of a three year old.